The remnants of my lunch lay in front of me and really all it is is a stain on an empty plate. 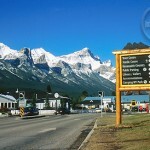 Compared to Banff, Canmore has so many great options for lunch. Whereas everything I seem to eat in Banff appears to be accompanied by fries, there is a much greater and healthier selection in Canmore and none more so than Communitea. Sometimes host to great intimate gigs, sometimes a superb place to sip one of a hundred different teas, it also has a menu that demands to be tasted. Make sure to pop into downtown Canmore for lunch in Communitea. The sandwiches are delectable with choices such as portabella mushroom with goat’s cheese and the salads are huge, healthy and packed full of taste. My choice and always my favourite is the rice dish with Thai red curry. I don’t think it is possible to pack any more vegetables into one dish. Broccoli, peppers and carrots are all hiding somewhere in the huge bowl that is brought out to you. The staff is as friendly as possible and helps you make your decision as you struggle at the counter. When lunch is finished, there is no better way to digest all this healthy food than with a coconut, white tea which immediately makes your body feel healthy after all the damage Banff nights can do to it. If you are going to be staying in Canmore or even just visiting, make sure to pop into Communitea for a memorable lunch.